2. What’s Wrong with IPv4? 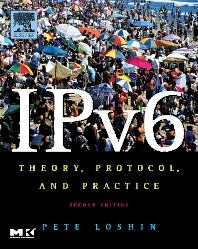 The second edition of IPv6: Theory, Protocol, and Practice guides readers through implemetation and deployment of IPv6. The Theory section takes a close, unbiased look at why so much time and effort has been expended on revising IPv4. In the Protocol section is a comprehensive review of the specifics of IPv6 and related protocols. Finally, the Practice section provides hands-on explanations of how to roll out IPv6 support and services. This completely rewritten edition offers updated and comprehensive coverage of important topics including router and server configuration, security, the impact of IPv6 on mobile networks, and evaluating the impact of IPv6-enabled networks globally. Pete Loshin's famously lucid explanations benefit readers at every turn, making Ipv6: Theory, Protocol, and Practice the best way for a large diverse audience to get up to speed on this groundbreaking technology. Pete Loshin writes and consults about Internet protocols and open source network technologies. Formerly on staff at BYTE Magazine, Information Security Magazine and other publications, his work appears regularly in leading trade publications and websites including CPU, Computerworld, PC Magazine, EarthWeb, Internet.com, and CNN.